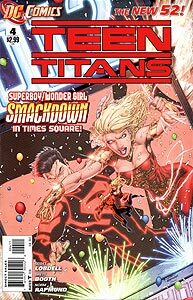 Brief Synopsis: The Teen Titans assemble to combat Superboy, agent of N.O.W.H.E.R.E. 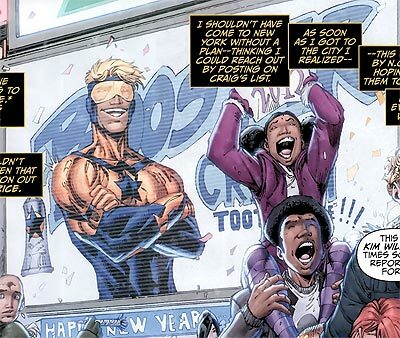 PRODUCT PLACEMENT: Booster Gold appears in a digital advertisement in Times Square, New York City during the annual New Year's Eve celebration. Though the product name is partially obscured, it appears to be "Booster Cream Toothpaste." 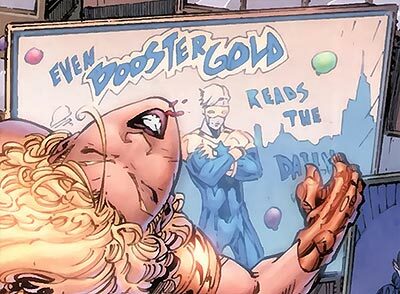 This is the first product endorsement by Booster Gold seen in the post-Flashpoint DC Universe. Among the New Year's advertisements seen in Times Square can be seen a partially obscured sign for "...ORD indistries" [sic]. 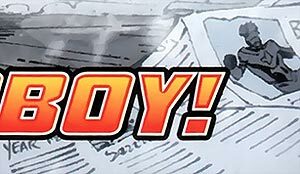 Does this mean that Ted Kord's KORD Industries is a successful corporation in the post-FlashpointDCU? EXTRA, EXTRA: Booster Gold appears in a discarded Daily Planet newspaper on the ground. This is the first time that Booster Gold has appeared in print in the post-Flashpoint DC Universe.